Do your kits specify how many strands of thread to use? I always use three strands unless a kit says to use two. It’s just my personal preference, and it’s how I learned to cross stitch 15 or so years ago. I once ended up with too little thread because I didn’t read the instructions correctly and used too many strands. HTH. In my instructions it says to use 2 strands. Thanks for that info tho, because I hadn’t really thought about people using 3. I will be adding a few more additional lengths for each color from now on. Thanks!! I like kits that have long lengths of floss then I can use the single strand folded (loop) method to start which saves one tail. When I have barely anything left in the needle and can barely make a stitch is when I end that length. So I’d say my tails are the length of a needle or thereabouts. My tails are as short as possible to still keep the ends in the eye of the needle and be able to tuck the point of the needle under some threads!! I do often do each X as I go, but depends on the pattern. I rarely run out of thread from a kit. Mind you, I prefer to buy patterns and kit them myself. That way I can pick my fabric to suit. I use petite needles so I can use more of each piece of thread. My longest ort/tail would be 1-1/2″, if that. Thank you so much for the comments! 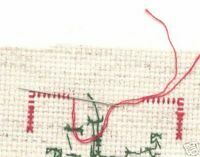 It tells me that most stitchers use as much thread as possible. I just need to account for newbies 🙂 I’ve definately learned from a few mistakes and will now be adding more thread in my kits!